GaryMoller.com - Health, Fitness - Naturally! : Is there a link between depression, fatigue and nutrition? Is there a link between depression, fatigue and nutrition? The mineral copper is involved in the production of neurotransmitters in the brain. A deficiency of copper can lead to depression. High calcium to potassium is associated with an underactive thyroid. Fatigue is often a common complaint associated with low thyroid function. 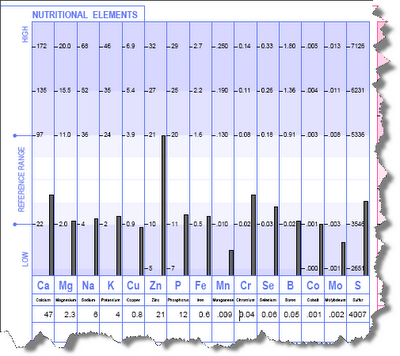 What can be seen in the chart to the left is this person is very low in many base minerals other than calcium, zinc cromium and sulphur. In nutrition, the ratios between nutrients are almost as important as the concentration of each. The example here is typical of what comes across my desk, showing what happens when commercial food interests and single issue health lobbyists dictate public nutrition advice. High calcium, low fat, low salt, "heart healthy" diets are not healthy for every one. Some of us need more fat, more salt and more protein: Whereas others need less of these - some or all. The person, in this case, has chronic health issues, including tendonitis and fatigue and is at risk of becoming depressed. It is all to do with diet. The solution lies not in toughening up this person by joining a gym and/or counselling. Exhausting exercise may actually make things worse and counselling may only serve to buy some time. The solution, in this case, lies in adopting a low calcium, high protein diet that is low in fats, oils and carbohydrates and one that is high in vitamins and minerals. This includes taking a number of nutrition supplements for several months to expedite the process of replenishment and balancing. While the counselling can commence, the gym is best left till later on. Contact me if you would like to learn more about this form of nutrient testing.